"I recently tried to upgrade iOS on my iPhone 6S. There was an error during the process 3004 to stop my updating. Please help." "The iPhone could not be restored. An unknown error occurred (3004)." Some of the users complained they encounter iPhone upgrade error 3004 in recent days and they are so annoyed due to no helpful solution yet. It is actually not an uncommon iPhone error and it is able to fix. Please complete the below quick ways to repair this iTunes error. The easiest and fastest way to fix error 3004 in iTunes is to check if your iTunes is in latest version. If not, you have to update the iTunes into the newest version immediately to support the latest iOS system. The latest version is able to obtain on the Apple website or via some other third party software. iTunes error 3004 can also be caused by connectivity error. If the network connection is accidently halted during the update or restoring process, iTunes unknown error 3004 will pop up as well. What you have to do is to restart the WIFI router to see if this can remove iTunes issues. You can also check the USB by extracting it and plug in again. Generally, antivirus programs bring about create connection or software conflict for iTunes. To make sure whether the antivirus software in your Windows 10/8.1/8/7 is the main reasons for iTunes error 3004, please navigate to turn off them for a few minutes. In addition, you need to leave the computer without any websites browsing while you do a restoring or upgrade. Firstly, here is a highly recommended freeware to repair iTunes error — TUNESCARE, which is a super handy iTunes repair tool to easily and quickly fix all iTunes syncing problems and iTunes error 50 for free. Secondly, if the basic ways are not able to get your iPhone/iPad out of the annoying error trouble, this is a recommendation for you that can be really helpful. Tenorshare ReiBoot is a professional repair program that enables users to fix all kinds of iOS stuck issues and iTunes errors with friendly-user interface. Step 1. Download and install this repair program in your computer. Connect your iOS device to computer with USB cable and launch Tenorshare ReiBoot. System Recovery Mode is recommended firstly that will not cause data loss. Advanced Mode is recommended if system recovery under regular mode cannot fix the iOS system issues, but it will wipe out all data in your device. Step 3. Click "Download" button to start downloading the firmware package online. If something got wrong during the downloading, you can click "Copy" to download through browser. Step 4. 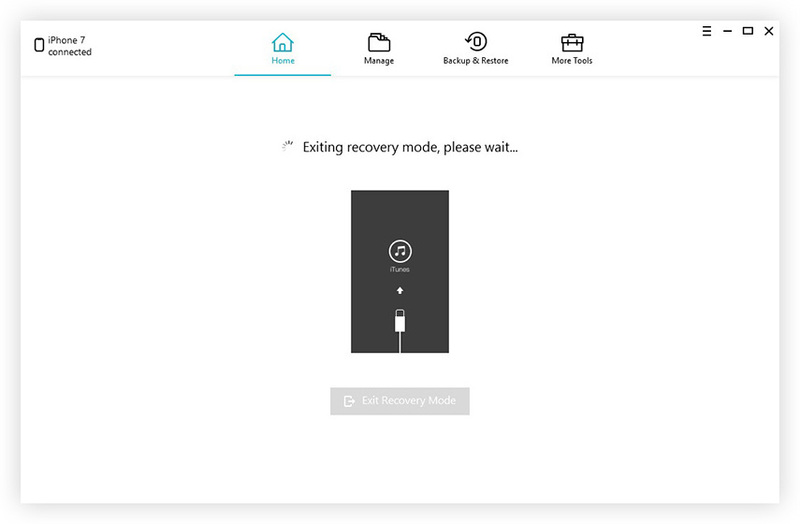 Once the firmware package is downloaded completed and successfully, you can click "Start Repair" to start system recovery. Step 5. When the repairing process completes, your iOS device will boot up as normal. iTunes error 3004 fix is actually an easy case if you have Tenorshare ReiBoot. For some more wonderful iOS repair tool, Tenorshare iCareFone is my second choice when I encounter some iPhone/iPad stuck problem. It is an all-in-one great assist to remove all of your iOS issues.